So one hundred and ninety-two posts, a whole lotta hits and a great number of new friends later, I sit here at the year one anniversary of my very first House of Flying Scalpels post. It all began when I decided I wanted to learn how to write and I had an interesting opinion to voice. Most people know I only really have two comic reading friends in my neighbourhood, and this love has always been a lonesome exploit. I read many a blogging website and deliberated upon how I would write my reviews. I made a couple of attempts and asked some friends what they thought. On the whole and they were quite positive and informative, giving me the support I needed to take the plunge. So here I am one year later, reflecting on a large amount of material and time devoted to the House. The art of writing begins with a single step, putting pen to paper, or in this age, tapping word to screen. Writing is the art in itself; its cathartic, it’s organising, it’s exploring, and it takes you places where you never knew you could go. In writing about comics, I found something to write about and went on an expedition across the globe. Not only has my knowledge of comic history deepened but my insight into the creator’s artistic processes has widened. Along this journey I have found many wandering explorers who I have taken with me and many who have taken me with them. I have joined a fraternity I knew existed, but never knew how to be a part of. Say what you will about social media but Twitter and WordPress have improved my quality of life. For that I will be forever thankful. The thing I adore most about the comic world is how it has really taken to the increase in communication technology. There has always been a comic fan letter page and a comic conference to attend, but now we have direct and immediate ways of interacting. For the most I would like to think this is a great thing, as fans are able to relay their voices to creators and each other. Of course not every creator would agree with you, as it is almost a fashion to post abuse without really digesting the art. There is a place for criticism and a way to voice it, without being offensive. I find writing about work I do not like incredibly stifling, because not only do I enjoy reading comics but I enjoy writing about them. I dislike writing negatively as much as I dislike reading certain comics. However this is my personal process and my prerogative and if I were to write for a larger brand, then I would have to develop the skills of negative critique without hostility. But what I like to think we all share as writers, artists and readers is passion, and that is what brings us together. It is passion that forces me to write my blog, it is passion that intrigues you to read a review, it is passion that makes you draw a character and it is passion that inspires you write a comic. When that pervades through all that you do then it brings people together. It is incredibly comforting and joyous and is the reason why I write about comics. I have moved from having two comic book friends to staying up till 3am to videocast my love with people from the United States and Brazil! It truly is an incredible adventure and I look forward to meeting more and more people to share it with. The validation I receive from my blog comes from the people who read it and the creators who take the time to appreciate it. The latter comes rarely but when it does, it is inspiring. 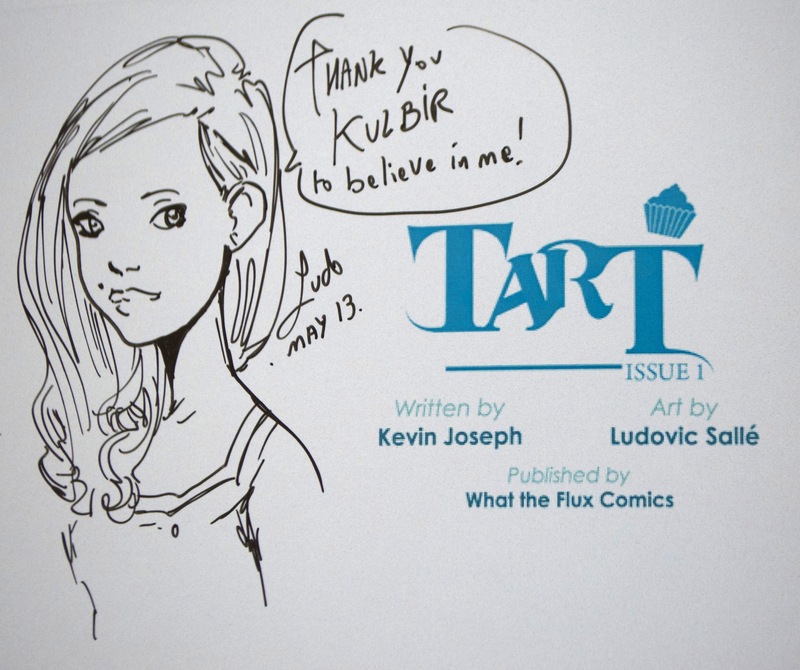 I was sent the first Tart comic as a gift from Ludo and Kevin, and it completely took me aback. I never imagined that the fleeting thoughts I place on paper actually resonated with the creators’ own. I was touched by their comments. The tweets from Chris Samnee and Ande Parks from my recent Capote in Kansas review had a similar effect. It makes all the effort and time completely worthwhile. As a creator it must be so important that your ideas come across and strike empathy with the reader. It is this interaction that makes the artistic process continue well past the finished product. The reviews I write have yet another aim; for the reader to experience something they have not read before. If only one person reads the review but inspires them to do something then that is enough for me. Even if it is pressing the like button or posting a comment in disagreement, then it means I have made people think about that comic. The best outcome would be for them to go and buy the comics and enjoy it as much as me. One day I would love to have this kind of impact on the non-comic reader. As you can tell I love doing this, and gather so much enjoyment in many a way. I never began to imagine HOFS would progress to where it is now, and it has taken me to so many places I never dreamed of. For those reasons, I would like to thank everyone out there for reading and sharing your thoughts. I hope you continue to do so for as long as I can remain passionate. Above all else, continue to interact and show your support for people you like and work you endorse. And for those would be writers out there, if you love what you read and want to tell the world, then make sure you do so. It may take time and energy, and the support you want may not come as quickly as you like, but you must endure. Do not get bogged down in statistics and “likes” but keep it going for as long as you possibly can. If you write with love and passion, then someone out there will feel that and will give it back to you, they always do. Congratulations on your first year of House of Flying Scalpels. I always enjoy reading your blog so much, you review so many great comics. Blogging is such a rewarding experience, like you, I have made a lot of new friends through writing, its been great fun. Well done, keep up all the great work, and here’s to another fantastic year at the House of Flying Scalpels! Kulbir, Congratulations man! It has been an honor to count you among my friends! To Many More Years Of Friendship And Long Live The House Of Flying Scalpels! One year! That’s an impressive milestone sir… Keep fighting the good fight! One year! That’s an impressive milestone… keep fighting the good fight!